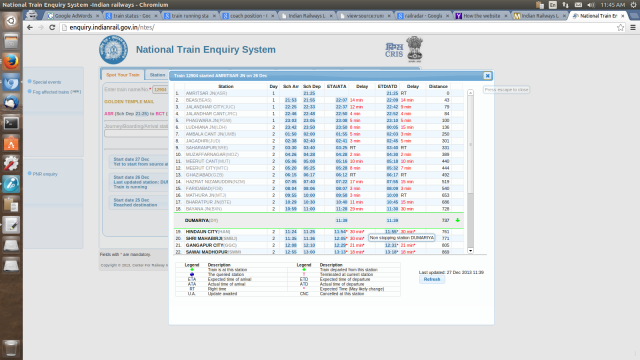 Enter valid five digit train number in the form above and hit 'Get Train Running Status' button. A new web page will be opened with more detailed information about your queried train number. At the top of the page you will find a form that asks you to provide information about your journey station and journey day. Enter your journey station and and journey day and click on 'Get Train Running Status' button. A new web page will show current location of your train from the station you are starting journey. It will also inform you about train's expected arrival and expected departure time at your station. Suppose you have to catch train 15018 (GKP LTT Kashi Express) from Jabalpur railway station on 20 June (consider the date as today). You are aware that the scheduled arrival time of train number 15018 at Jabalpur railway station is 23.30. So to track live position of this train on 20th June till time 23.59, you will fill 'Journey Day' option as 'today'. Suppose train becomes late and you are tracking the same train after 23.59. As you know after time 23.59 date will change to 21st June, you will select your journey day option as 'yesterday'. In case train running status for your queried train number is not delievered, there could be several reasons. You entered an incorrect or invalid train number. Train does not run on the date it is being queried. Train is not yet started from its source station. Step 2: Enter correct text provided in image to verify yourself as human and click 'verify' button. Step 3: After successful captcha image verification you will see a window like this. Enter train number in the box provided as shown in image. Step 4: Once you will enter correct train number a window will appear showing the scheduled route time table of that train. Note that this is not live running status of train. Step 5: To get the live train running status, click on a button in the right hand side that says "All Running Instances". You will see running trains list with date and time. 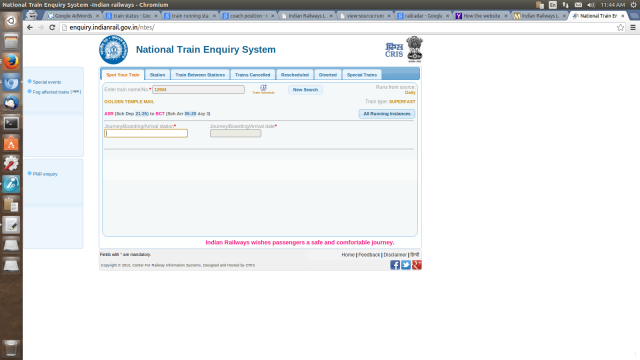 Step 6: Click on the option that goes with your desired train enquiry. A detailed window as shown in image below will appear, that will provide station by station running update of train. Note: This website may not work properly on few mobile phones. In that case you can use service of 139. Just call *139# and follow on screen information to locate your train. Also note that your operator may charge you for the same.